The Press of Robert LoMascolo is pleased to announce the availability of a new book! Aurora "Then and Now" was written by the Southern Cayuga 2011 Local History Class, under the direction of Barbara Casper. The book lists 32 historic properties in the village of Aurora, accompanied by many photographs. 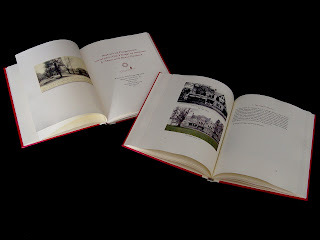 The book has been designed, digitally printed, and hand sewn and bound by Robert LoMascolo. This 72+ page book is printed on very good quality paper, with hand painted hard covers. The dimensions are 6.75" x 8.5" when closed. The cost for printing and binding is $45 + postage. Copies are bound as ordered, and may be requested by contacting Rob.